It is super easy to make your own Kombucha brew. Tea, sugar and water are the main ingredients you mix with the SCOBY and then it takes care of itself. Below is my favourite recipe. How to Get a SCOBY? SCOBYs are living and thriving colonies of bacteria and unfortunately, you can’t just pick one up at your grocery store. There are several ways to acquire a SCOBY. If you know anyone who already brews Kombucha, ask him or her for an extra SCOBY and they will probably be glad to pass one on. The SCOBY has a “baby” every batch or two and this baby can then be used to brew Kombucha. Where to get it? You can order a SCOBY from an online source. Just make sure the source is reputable. I prefer a trusted site like Happy Kombucha. Table water bottles. I loves the Italian ones you can see on the picture above and buy them in set of six. 0,5 oz (15 g.) of tea = 3 tsp - black, green or white tea. I prefer Silver Needle or Ryokucha Midori a green tea from Palais des Thés, which gives a fine cider taste - or a mix of the two. Pour suger into the saucepan. Pour 8 cups (2 liters) of boiling water over the sugar. Add 4 cups (1 liter) of cold water. Pour the tea into the vessel. Add SCOBY and kombucha brew. Set in a warm location out of direct sunlight (ideal temperature 20-25 Celsius). Fresh air is good too. Ferment for 8 to 14 days. The SCOBY usually float to the top within a few days. If not, it's also ok.
During the fermentation will SCOBY, which is called the Mother, will produce a new culture that settles at the top of the vessel, that one is called the baby. Taste the brew after 10 days or sooner, depending on the temperature - some would say already after 8 days. It should taste a sour with sweetness - a bit like cider. When you are ready to taste your brew, gently insert a straw beneath the SCOBY and take a sip. If too tart, then reduce your brewing cycle next time. If too sweet, allow to brew for a few more days. Continue to taste every day or so until you reach your optimum flavor preference. Pour the finished Kombucha drink through a strainer into bottles. Tip: If you want to carbonise your kombucha, place the bottles at room temperature for two to three days before you refrigerate. Save about 10% of finished beverage to a new process. Keep the SCOBY in a mason jar with some fresh brew or apple cider vinegar and and sugar and store in refrigerator for later use. Some claim that you can store it for up to six weeks. I've stored mine for much longer with no problem. 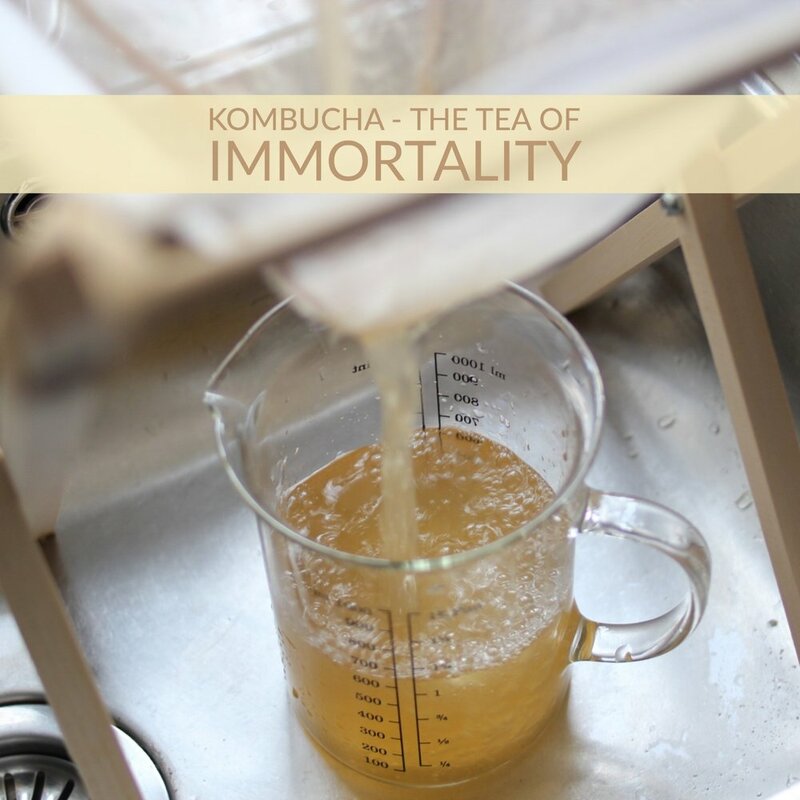 Kombucha has been around for thousands of years and the SCOBY has a very strong survivability. Can you give some of your fungus to others who want to brew. Kombucha brewing is a very flexible system. You only need a small piece of SCOBY to succeed with your brew, and you can also use more SCOBY's in a brew at a time. Mostly I use both mother and baby in my brews, and sometimes I tear them over and share or increase my production volume. I have 2x3 lites in rotation most of the time. I usually ditch the mother after two or three brews and go on with the baby. When your kombucha is done and bottled, you can enjoy it as it is, or you can add som flavors to it. Like spices, fruit, and veggies. 1 tbsp organic blueberries - fresh or frozen. Drink as desired! Go slowly in the beginning. You can start off with 4-8oz on an empty stomach in the morning, if this feels a bit too hard on the stomach, then wait til after breakfast. Then have some with meals during the day to help with digestion or just listen to what your body tells you. I drink a glass in the morning and one at night. Drink plenty of water too, as Kombucha is a natural detoxifyer and you want to flush out the newly released toxins. It’s said that the stomachs that are rumbling most when they get fermented food, are those who need it the most. So if you have a good intestinal flora, you can hardly get too much - if you don’t, you need to slowly grow the gut accustomed to it.